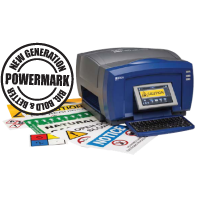 The BBP85 Sign and Label Printer is a thermal transfer 300dpi benchtop printer to create bold, multi-coloured custom visuals up to 254 mm wide. It features a large touchscreen and intuitive, easy to use interface. The Brady Workstation Basic Software Suite is included with every printer, all you need to do is download it on Workstation.BradyID.com/Free.